The headquarters of the Guinea-Bissau National Assembly in Bissau. 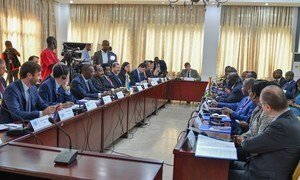 Hopes are high that the vote will help end a political crisis that has been simmering since 2015, as member of the UN Security Council heard for themselves during a fact-finding visit to the West African nation at the end of last month. Back in 2015, then President, José Mário Vaz, dissolved the government of Prime Minister Domingos Simões Pereira, whose party had won a majority in elections the previous year. Since then, there have been seven different heads of government. Electioneering officially ended on Friday, with thousands of supporters of the 21 political parties contesting the vote – the biggest total ever - rallying in the national capital Bissau. In keeping with electoral law, Saturday was free of campaigning as UN News witnessed, on a special reporting trip to the Portuguese-speaking nation, but the billboards were still standing tall. Red, green, and yellow t-shirts were still seen all over the city. Inside some of the capital’s hotels, more than 130 international observers started being dispatched to every one of the eight regions of the country of 1.9 million people. The chief of mission for the African Union, Joaquim Rafael Branco, working with a team of 50 observers, told UN News that “the people of Bissau are peaceful,” and remembered the politicians from different parties he saw talking to each other over the last few days. “That’s a good sign” for after the election, he said, remembering all parties had signed an agreement committing to accept the results. After some controversy in the last few weeks over electoral lists, an audit was conducted, resulting in some agreement by Wednesday over the process, overseen by the National Elections Commission, CNE. The chief of the observers’ mission from the Community of Portuguese Speaking Countries, CPLP, Luiz Vilarinho Pedroso, said that had been one the biggest obstacles, overcome with the agreement of all the parties. The Brazilian ambassador noted that elections had normally taken place “in an orderly manner”, but he warned that the post-election phase had historically been when political issues became most acute. The Santa Luzia neighbourhood, adjoining the pink walls of one of the city’s hotels here in the capital, is one of the biggest in the city of around 400,000, and its unpaved roads were filled with families and friends the day before the election. On a corner, two friends listened to a local radio station playing the latest news from the campaign trail. Some people were sewing outside, others cooking, children were playing in the heat. Many groups of young men under the shade of trees, talking sports or playing a traditional board game that resembles checkers. 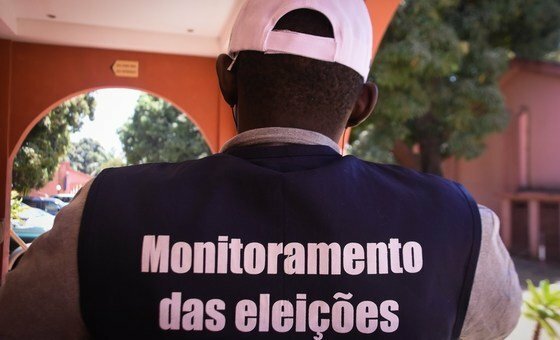 Local election monitor in Guinea-Bissau., by Alexandre Soares. “Work, education, and health,” Embalo he added. “Those are our main problems and what we’re focused on now this election day.” A couple of blocks from Embalo, Ivaldine Joana Landim, 30, is visiting some family and friends. She doesn’t sound hopeful about the future, but she will vote this Sunday hoping better days are coming. A good day, she says, would be “to get to the hospital and have all the medicine and resources” to treat her patients. The UN Peacebuilding Office in Guinea-Bissau, UNIOGBIS, in partnership with other agencies from the UN system, has been helping prepare for this election over many months. They have trained, or supported the training of around 80 police officers, 400 civil society members, around 450 electoral officers, and 120 journalists. They have also held workshops for youth and women candidates, inviting five from each party to a workshop, and offering them smartphones and megaphones to help with them take part on a level playing field. The mission and the agencies have also partnered with a 400-plus network of national monitors, helped create a fact-checking unit of 6 journalists, and offered technical support to write and negotiate the Stability Pact and the Code of Ethical and Electoral Conduct. Public information town halls were held in about 40 villages. “Because of some donor fatigue, in spite of all those difficulties, yes, everything is ready for the election and we expect that it will be peaceful, free, and fair,” she said. Preliminary results are expected on Monday night. The official tally should be announced on Wednesday, and the party that gains a majority of the seats should be invited to form a government. According to national electoral law, the country should hold presidential elections either in October or November. Since the declaration of independence from Portugal in 1973 and recognized a year later, no president has so-far completed their full term of office.